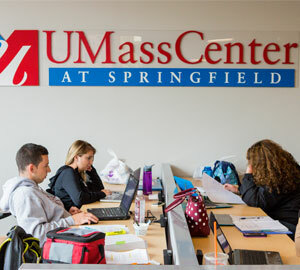 Since 2014, the UMass Center at Springfield has provided local access to high-quality and affordable education, training, research, and other programs. The Center is located at Tower Square in downtown Springfield, Massachusetts. The 26,000 square foot space features 10 classrooms, a computer lab, meeting/study rooms, administration and faculty offices, a learning commons, and a student lounge. The Center also hosts community based events for partners in the academic, non-profit, and for-profit sectors. Building on research started in 2012, UMass Donahue Institute provided an analysis of the 75 off-campus locations for the University of Massachusetts along with research about other satellite campuses. This report provided insight into which locations might best be suited for the University to consider a satellite center. This initial report showed the value of both academics and community outreach as functions of the satellite. Subsequent data showed that Springfield was an ideal location for the University’s first system-wide satellite center based on its Gateway City status, the diversity of its population, and the need for additional academic and community engagement opportunities in the city.